It seems like everybody is doing it these days. First, Russia did it (in 1959) by landing a probe on the lunar surface and taking pictures of the far side of the Moon. Then the Soviets put the first artificial lunar satellite into orbit in 1966. Not to be out done, President Kennedy had already begun the US quest to get man on the Moon, and in 1969 the superpower achieved that goal. For a long time it was only the two competitors in the Space Race who had visited the Moon, but in 1990, Japan joined the “Lunar Club” (with the Hiten spacecraft). Then in 1997 Hong Kong (China) succeeded in two flybys (HGS-1, a commercial satellite). Eventually, in 2006, the European SMART-1 space vehicle made it into lunar orbit. But since then, it’s been China (with the Chang’e program) and Japan (with SELENE, or “Kaguya”) who have been most active around the natural satellite. And now there is a new kid on the block: India. One of the most populous nations in the world is pushing ahead with its own aspirations for lunar exploration. Although comparatively small, the Indian space agency ISRO was established in 1972 to develop space-based technologies in the aim of enriching the nation’s economy. 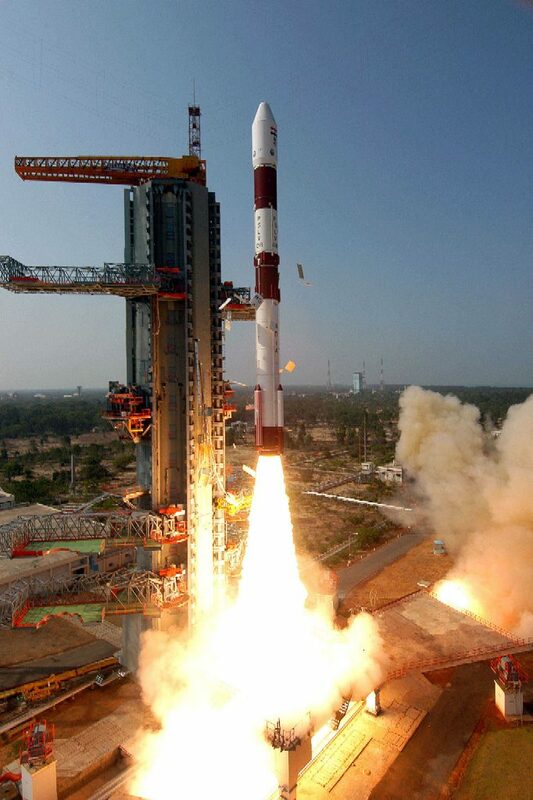 Until the early 1990’s, India had to rely on Russia to launch payloads into space, but 1994 saw the first successful launch of the powerful Polar Satellite Launch Vehicle (PSLV), lifting domestic and commercial satellites into orbit. Now the PSLV will launch India’s most valuable payload yet, the Chandrayaan-1 lunar orbiter and impactor. It is scheduled for launch on September 19th. In a speech on India’s 61st Independence Day from the historic Red Fort in Delhi, the Indian Prime Minister Manmohan Singh called the Chandrayaan-1 mission “an important milestone” for the nation. However, although a date has been set for launch, some of the text seemed a little uncertain. “This year we hope to send an Indian spacecraft, Chandrayan, to the moon. It will be an important milestone in the development of our space programme,” Singh said. Whether the “we hope” was accidental or whether the launch date is only tentative remains to be seen. Regardless, the mission appears to be good to go, obviously a huge boost to national pride. “I want to see a modern India, imbued by a scientific temper, where the benefits of modern knowledge flow to all sections of society,” he continued. According to the chairman of isro chandrayaan is slated to launch in mid october this year. Chandrayan 1 has been in plans for a long time now and it is actually a project that also lets other nations to piggy ride on ISRO’s vehicle to moon. It was planned for March/April of this year but got postponed to September and the finally to October of this year. Chandrayan 2 is already in plans…. Yes, October is the latest date for launch — ISRO say it is due to vacuum tests that have yet to be carried out on the launch vehicle. NASA and ESA and Bulgaria are also involved with this mission (with scientific instruments onboard…etc.,), and it has been suggested that if India attracts more international partners in the near future, their intended 2020 manned mission to the Moon could be shortened by upto a year. For a country like India achieving great strides in this area, it has to be very encouraging for other countries — who wouldn’t normally be thinking about the Moon, but have other space activities — to get more involved in lunar research. Did you know that an INDIAN SPACE SHUTTLE is in the anvil ? Well it is. It won’t be a copy of the American and Soviet space shuttles. India’s one is unmanned (initially) but manned exploration is also being researched. Well done India for realising that space resources are the way to finance the future. Wansh, there is plan for an RLV which is almost what a space shuttle does. Its reusable. But initially, its gonna be unmanned. They’re planning a Mach 7-8 velocity machine. Something which looks like a ScramJet. Imagine.. by 2020 we could find ourselves in a 4-way space race – USA, Russia, China, and India. Or even 5-way, if the European Union has become much more tightly integrated by then and is launching their own manned misions as well. ISRO should include a probe to investigate the moon if it can handle India’s part of the population. As such there is nothing more to find on the moon, except some space for this extra population. China should also support ISRO in this mission. ISRO is doing a great work where it is reducing its dependence on major powers on space technology and developing projects on its own.Hope it will have a mission to mars in by 2020. Note that America is not reliable. For Example, they signed contract with India on global navigation system. But they stoped that facility for 2 times at the time of their war with Iraq. I strongly suggest not to go with America for india’s lunar mission – III.